We love craft activities, but it can be hard to find the time to plan, buy materials AND actually do the thing, so I was so pleased when Weekend Box Club sent us one of their new Mini Boxes to review. Most Saturdays we head to the library and read lots of books in the book corner, and then while the boys are rolling around the area-that-isn’t-soft-play-so-get-down-or-we’re-leaving I pick a few books for them both. Sometimes James picks books, too, and I do like those weeks – he picks books based on the picture on the front, of course. His favourite books are those with dragons on, or lions, though if there’s a mouse or a ladybird than he’s totally hooked. This week, he picked the majority of the stories including this book called A Forest, by Marc Martin. It tells the tale of a forest, which people chop down and replace with other trees at first, but then build cities until the air turns thick. A storm comes and washes away all of the buildings until there’s only one tree left. Fairly apocalyptic. So we have been talking about how trees keep the air clean for us, and why we like to have trees and plants around. We’ve also discussed why it wouldn’t be a good idea to chop down forests and replace them with buildings, one of the reasons being that animals and birds would have nowhere to live. Of course we need some wood to make things with, and so we also talked about planting new trees to make sure we always have forests. And so it was a nice coincidence when our Weekend Box Club mini box arrived, since the theme of the box is Rainforests. This has opened up more discussion about what a rainforest is, and how it’s different to woods and forests near to us, but also quite similar; we don’t want to chop the trees down in either, and the wildlife is a bit more colourful in the rainforest. The Weekend Box Club mini box is a new idea – perfect when, like us, your children are mostly at nursery and you don’t have bags of time to do crafting or baking together – just the weekends. 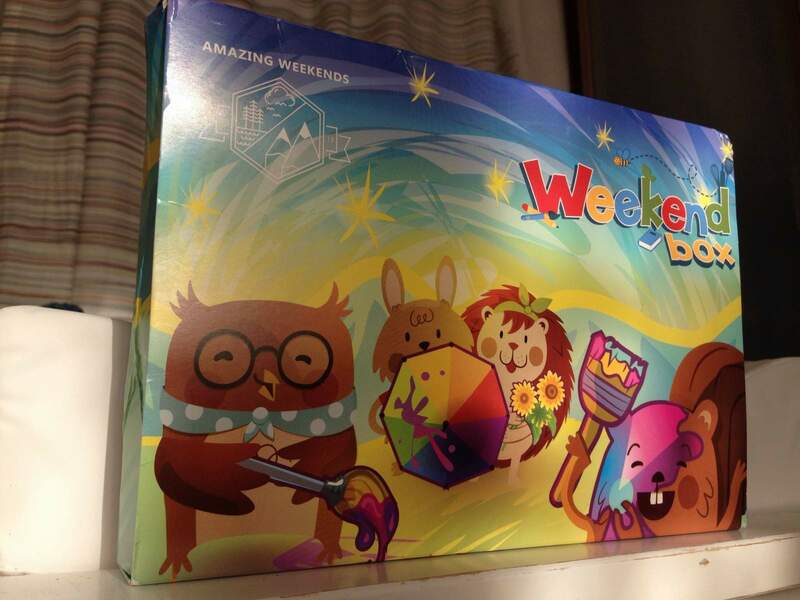 The kit comes in a little box addressed to your child, and contains everything you need for two brilliant activities. The bigger boxes have four kits, and when we’ve had the boxes before we’ve not managed to get all four done (we now have a good supply of things we can do if we have a surprise day together, or for half term). So for us, these new mini boxes are ideal, and are a really good price at £4.95, I think, particularly because that includes delivery (so no hidden charges). Each themed box has two things to make, bake, explore or grow. Ours had a craft – a rainforest parrot mask; and some seeds and soil to plant to grow something. We didn’t get an email before the box arrived telling me what I’d need to buy or have in the house – you do get that heads-up for the bigger boxes, so maybe you will normally with these. Anyway, we needed a bottle, which I didn’t have in the house so we could only make the mask right off the bat. The template, crayons, and two coloured sheets of paper were provided, as well as a sheet of foam. We also got a glue stick, so there was no excuse to jump right in and make a parrot! Really simple but a super activity. Perfect for feeling like we’ve done something together, without having to actually think about what we’re doing! We also planted some seeds in a bottle. This second activity I actually helped James with while the pasta was cooking on Sunday evening, so it wasn’t a big task, but again – if I didn’t have the things in there’s no way we’d have made something like this, even though it’s so simple! The soil came in these little pellets, and the absolute sheer surprise and joy in James’ voice and face when he saw the pellets transform after being in contact with water! Wow! The bottle has a little piece of string in, and I had to make a hole in the lid and thread that through, but otherwise James could do it all by himself with me telling him what the instructions say. It was really nice to be able to begin to grow a plant following on from our discussions about forests. Of course we don’t actually know what we’re growing, so that surprise is also still to come! If you are feeling inspired by this review and want to try your 1st Weekend Box for free – click here or use the code HELENA75922 when signing up!